My training over the last few weeks has been ramping up pretty steeply into a pattern of fairly high-volume (at least for me). This week, I’m riding and running six days a week. I’m up to 8 miles a day on my runs and my rides are about an hour long– so a little over two hours of training each day. Plus, there’s my time spent on PT and recovery. I’m not one of those guys who loves tons of endurance work, so why such high-volume this early in the season? The short answer is that my training is following a very polarized form of training right now. The volume work that I’m doing isn’t like last year– this is all just slow running and cycling. To be really conservative, it’s mostly at a very low heart rate– usually less than 130 beats per minute. On a great day, this comes out to about 75% FTP on the bike and about a 8:30 mile. On a bad day, this comes out to about 60% FTP and a 11:00 mile. Fortunately, my days tend are generally “good” so I’m usually going at about 70% FTP and a 9:15 mile. But my training is also very polarized at the other end. On Tuesdays, I run a really hard set of very fast long intervals. My workout this week was a 2-mile warmup followed by 5 x 1200m (with 400m walking recovery) and then a one-mile cool down. The 1200’s were fast– right between mile and 5K pace. Spending about 4-minutes walking out a 400m after each one is pretty important physically and mentally– these are designed to really, really hurt. Thursday also focus on something shorter– 2:00 maxVO2 to max efforts on the bike. It’s really hard to go all-out on a bike except in a sprint. So the strategy is to keep an effort my watts at 120% for 1:30 and then just blast out the last :30 seconds. Done right, I’m hunched over the handlebars afterwards gasping for breath. After a nice 4:00 of soft pedaling, it’s back to the next interval. Each of these high-intensity days happens to also be the “off day” for the other sport. So I don’t ride my bike on Tuesday and I don’t run on Thursdays (although recently I’ve been switching my non-running day to Sunday). Over the last two weeks, I have been a bit too aggressive in folding in the cycling. Running for over an hour a day was tough but even adding a little bit of moderate cycling on top of that was just impossible. So I’ll try to be a little more patient with it in the coming weeks. I am definitely getting faster, but not in the way that I expected. If I were to run an all-out 200m, I don’t think my time would be any faster than 3 months ago– in fact, I expect that I would be slower. Probably same at 400m-800m. But at 1200m and up, I think I’m getting a lot faster. It’s a weird phenomenon that I discussed with one of my team’s other coaches recently– hard efforts don’t hurt any less but they are sustainable longer. So when I’m running an 800m effort, I would have collapsed at 800m. Now, I’m running the same pace and feeling just as miserable– it’s just that that misery is sustainable longer. I know that the Alter-G running that I have been doing is also helping with my speed. So far (knock on wood), the switch to slower running is keeping my injuries happy. Sure, my left achilles tendon and right plantar fascia aren’t perfect, but they are a lot better than last summer when I was running a ton of lactate threshold efforts. Of course, slowly adding a bunch of running miles has its own injury-proofing effect. I’ve always believed that doing speedwork on less than 30 miles a week is an invitation for a running injury. I don’t really have a good explanation about why that happens (one might think that less impact is better for keeping injuries away), but it seems consistent with what other coaches advocate. 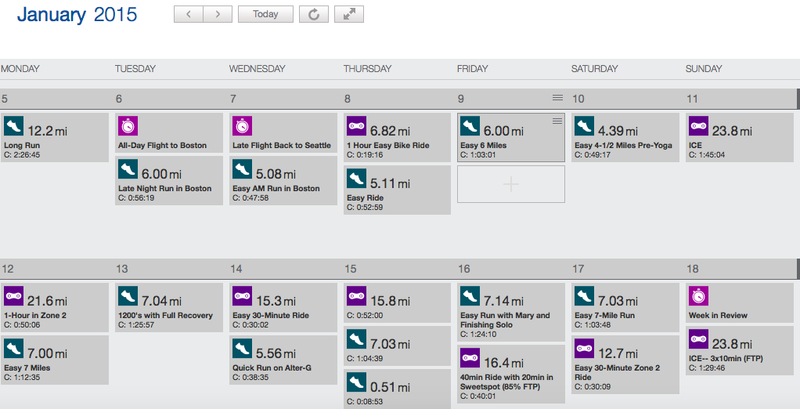 One of my friends (who is much faster than me) won’t even start running intervals on less than 50 miles a week. Of course, all this assumes that your biomechanics are pretty clean– otherwise, just getting up to 50 miles a week is begging for a serious injury. I’m hoping that this basic pattern and training load stays consistent over the coming months so that I can build some serious toughness in my legs, establish a firm aerobic base, and get some serious anaerobic work in. Then, to fully sharpen for races, a little voice is telling me to do a short 2-4 week period of more specific training. This would consist of 20-30 minute intervals at lactate threshold. Yes, this violates the core principles of a pure polarized training plan, but I’m still skeptical about dropping the most sport-specific form of training.